FurryPinas 2019 primer: What is a Furry? Khalil “The War Horse” Rountree Jr., 29, of Las Vegas, Nevada, United States was one of the winners at “UFC 236.” It was his fourth victory in the Ultimate Fighting Championship. Featuring 13 mixed martial arts matches, “UFC 236” took place at the State Farm Arena in Atlanta, Georgia, USA on April 13, 2019. In the 11th bout of the evening, Rountree competed in the light heavyweight division against Eryk “Ya Boi” Anders, 31, of Birmingham, Alabama, USA with Blake Grice as the referee. After three five-minute rounds, the light heavyweight bout was left in the hands of the judges namely Nate Mann, Will Fisher and Sal D’Amato. In the end, Grice raised the hand of Rountree, who was declared the winner via unanimous decision. Mann, Fisher and D’Amato scored the bout 26-30 in favor of Rountree. It was the fifth unanimous decision victory of the evening. Winning at “UFC 236” improved Rountree’s professional MMA record to 8 wins and 3 losses. On the other hand, Anders now has 11 wins and 4 losses. Training out of Syndicate MMA in Las Vegas, Rountree has been competing professionally as an MMA fighter since 2014. He was born in Los Angeles, California, USA on February 6, 1990. “UFC 236” marked Rountree’s seventh UFC outing. This does not include his one bout in “The Ultimate Fighter” where he lost via unanimous decision to Andre “El Dirte” Sanchez, 31, of St. Louis, Missouri, USA on July 8, 2016. On November 27, 2016, Rountree competed at “UFC Fight Night 101” at Rod Laver Arena in Melbourne, Australia. He lost to Tyson “Kangaroo Paws” Pedro, 27, of Sydney, New South Wales, Australia. 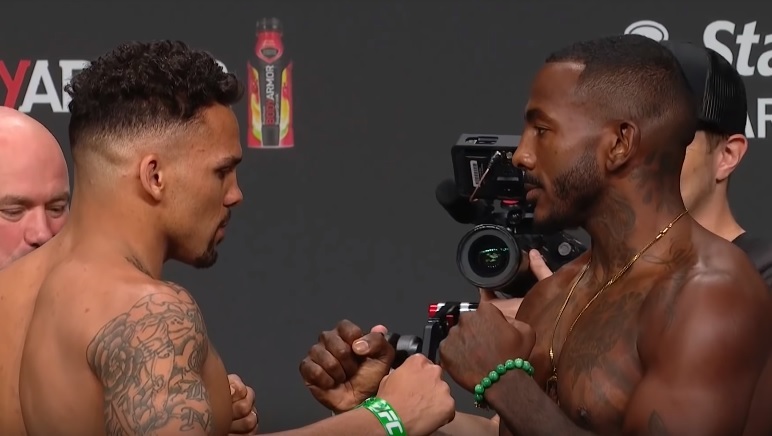 Before facing Anders at “UFC 236,” Rountree defeated three opponents in the UFC. They were Daniel “The Werewolf of Texas” Jolly, 34, of Austin, Texas, USA, Paul “Bearjaw” Craig, 31, of Coatbridge, Scotland and Gökhan “The Rebel” Saki, 35, of Kars, Turkey.